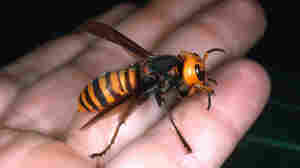 October 4, 2013  The insects are the size of an adult's thumb and can sting multiple times, delivering a large dose of venom. 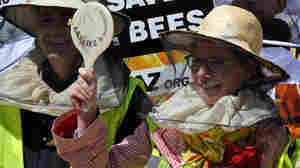 August 13, 2013  The rise in urban beekeeping could end up resulting in too many bees with too few flowers to feed on, two U.K. scientists warn. 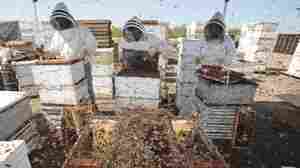 That's already the case in London, where the number of urban hives has doubled over the past five years, they say. Are Agriculture's Most Popular Insecticides Killing Our Bees? March 25, 2013  Neonicotinoids are pesticides widely used to coat the seeds of agricultural plants, especially corn. But some evidence suggests these chemicals may also be poisoning bees. A tell-tale clue: reports of massive bee die-offs that all took place during corn-planting season. 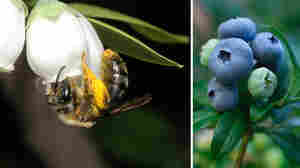 March 1, 2013  When it comes to pollinating our favorite crops — from coffee to watermelon — honeybees can't do it alone. 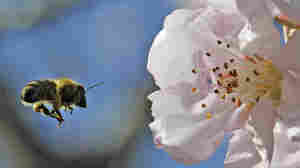 Wild bees in the field play a critical role in creating bumper crops, a massive new study reports. 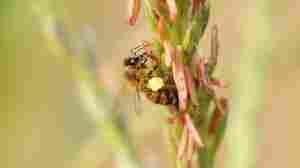 But these bees are disappearing, and scientists say the rise of crop monocultures is partly to blame. October 5, 2012  Beekeepers in Alsace couldn't figure out why their honey was coming out in shades of blue and green. But the answer was not far away. A plant that processes waste from an M&M factory was just too tempting to the bees. February 14, 2012  This month, the bees from 1.6 million hives — many of them trucked in commercially from as far away as North Dakota — will pollinate California's almond orchards. Then beekeepers will pack up their colonies and drive them back to the northern Plains, where bees can graze for the summer. But scientists says that floral feast in the Great Plains is shrinking because of high corn prices. November 7, 2011  American consumers like their honey bright and clear, but removing the pollen makes it hard to trace honey back to its source. A new report says three quarters of honey sold in the U.S. doesn't contain any pollen. 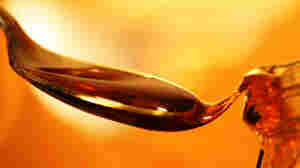 September 16, 2011  A man in a wheelchair was stung more than 60 times. His three rescuers were also injured. An estimated 60,000 bees were in the hive.